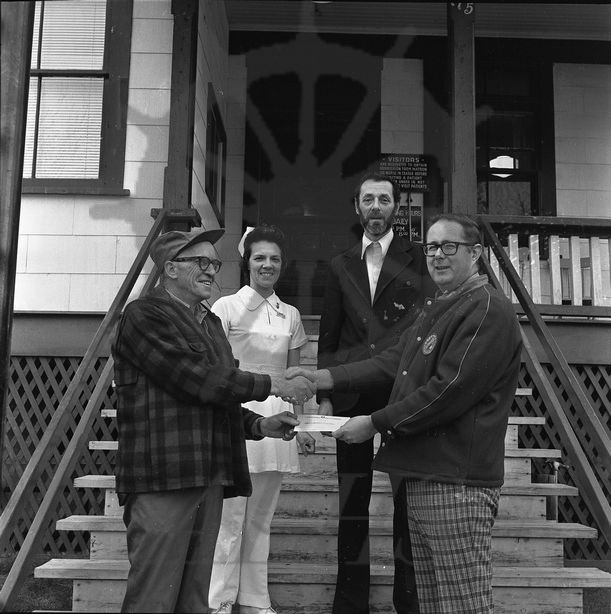 Bill Robison (right) of Kinsmen Club of Nakusp presents a cheque to Stan Fellows (left), chairman of the Arrow Lakes Hospital Board, on the stoop of second Arrow Lakes Hospital (715 Broadway Street West), Nakusp, ca. 1973-1974. The donation coincides with the construction of the new Arrow Lakes Hospital which opened later that year. In background are director of nursing Dale James (left) and office manager David Bowman (right).